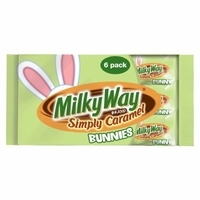 Milky Way Simply Caramel Bunnies are a perfect candy for your Easter Basket. 1.1 oz chocolate bunny filled simply with caramel. Sink your teeth into a crisp chocolate bunny shell filled and you will find a creamy caramel center. Kids and Adults will love finding these in their Easter Baskets. Buy your Simply Caramel bunnies now before they hop away. Each package has 6 1.1 oz chocolate bunnies.